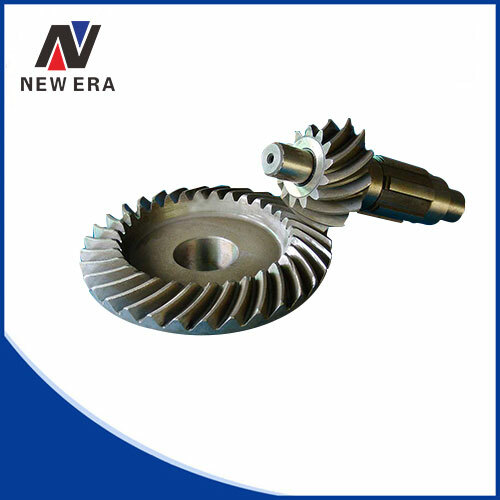 A spiral bevel gear is a bevel gear with helical teeth. A spiral bevel gear set should always be replaced in pairs i.e. both the left hand and right hand gears should be replaced together since the gears are manufactured and lapped in pairs. So what are bevel gears used for? You'll find bevel gears in various devices, and machines, including automobiles, power plants, marine applications, agricultural, forestry, gardening equipment, mining machinery and so on. With over decades of experience in exporting gears, we have been supplying shapes and sizes of gears, including bevel, helical, spur gears, worm gears and so on . Our team has continued to innovate and improve our capabilities with each unique product. If you have drawings for your gears, then we have experts to help with it. Our vast experience enables us to handle your manufacturing request carefully and thoroughly. Satisfying your needs is our priority. Our skilled technicians take every aspect of your project and bring in the best possible way. For more information on gears, make sure to contact us today!